Our interviews with the behind-the-scenes Figaro artists continues today as we check in with Beth Kirchhoff, Seattle Opera's Chorusmaster since the February 2000 production of Lakmé . JD: Beth Kirchhoff, this season at Seattle Opera has featured two big chorus operas (Aida and Pearl Fishers), two operas with no chorus (Elektra and Bluebeard’s Castle/Erwartung), one opera with only childrens’ chorus (A Midsummer Night’s Dream) and now Le nozze di Figaro, which has a smaller role for chorus. Is the chorus schedule always that unpredictable? How do you make sure you have enough good singers when you need them? BK: Actually, this season is rather unusual in the wide variety of demands for chorus....I LOVE that about my job. I was fortunate to be Interim Artistic Director at a local wonderful girl's choir a few years ago, and that truly helped to keep me more up to date with kids’ voices and their vocal abilities for the YAP production. Our chorus at SOA consists of a regular group of 36, who are offered contracts for 2 years at a time, and a roster of another 10 who are given "first crack" at the work whenever we need a larger group, say for a Verdi opera. Also, I am constantly in process of auditioning new voices, in order to keep a running list of available extras. JD: What makes a great chorus member? What do they have in common with the kind of singers who play principal roles, and how are they different? What do you listen for when you’re auditioning potential chorus members? BK: Great choristers are born, not made! First requirement to sing in an opera chorus is a healthy-sized, lovely, clear voice. I also listen for blendability, accurate pitch, and excellent language skills. A love for drama and a sense of humor helps too. The initial university/private vocal training is pretty similiar to a principal artist...basic "big voice", advanced degrees at a good music school, private vocal training. Our choristers have made life decisions to remain in Seattle and we benefit from that for sure! JD: Take us through the process of preparing the chorus for an opera like Le nozze di Figaro. What kind of materials do you give them ahead of time? How long does it take them to learn their music and staging? BK: The process begins months before an opera opens. With most operas, we begin music rehearsals about three months before opening night, and send out music about a month before that. For Le nozze di Figaro, our part is very small, (about 10 min of actual music!). So we only have three music rehearsals, all music is memorized by the end of those, and about four staging rehearsals. All of our rehearsals take place in the evening, because many of our choristers also have full-time day jobs. During the production weeks, these folks are working two jobs, very busy people. JD: So what do the chorus members do to pass the time when they’re just hanging out backstage, waiting for the Count and Countess to stop arguing about who’s hiding in the closet? BK: When they aren’t onstage, choristers are free to read, knit, review the words of next scene, listen to other music, study other music scores, etc. It’s never dull back there! JD: What’s the trickiest part of the opera, for the chorus? Most solo performers would say that Mozart looks easy on the page, but is terrifying to perform because it’s so exposed; his music is so perfect, any mistake a performer makes is going to be noticed. Is that true of the choruses, too? 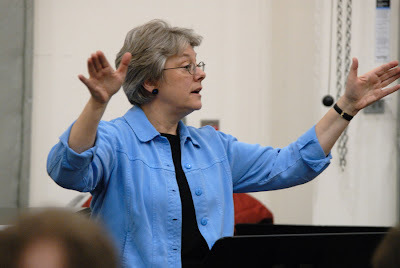 BK: Mozart choruses are generally not so tricky musically--the big challenge is to stay focused and energetic ONSTAGE, after such long periods OFFstage, maintaining the connection with the drama while you were away! JD: What’s your favorite moment in Le nozze di Figaro? BK: My personal favorite moment is in the Act 4 Finale, when Figaro, for one brief moment, sings "Tutto e tranquillo e placido"--all is tranquil and peaceful...beautiful Larghetto and melody in the orchestra as well, before all hell breaks loose and the plotting, scheming, and deceit picks back up. For a brief moment, we revel in the beauty of the night, his voice, his confidence in victory.....just for about 30 seconds! Although the chorus has a smaller role in this opera, I want to take this opportunity to express how much I appreciate the chorus in any opera. For me they are the backbone of most operas, supporting and expressing all that goes on. The combined power of many voices merged together. One unforgettable moment was the music of the chorus at the end of Act one in MacBeth. It was a sheer blast of passion! Whew! Thank you Ms. Kirchoff in sharing a bit of what goes on in preparation and behind the scenes.